The latest European news reports speak of it as 'under control' - it took them about eight hours to get to that point. In the coming days they are going to keep watch over possible smoldering fire and guarding the structure. 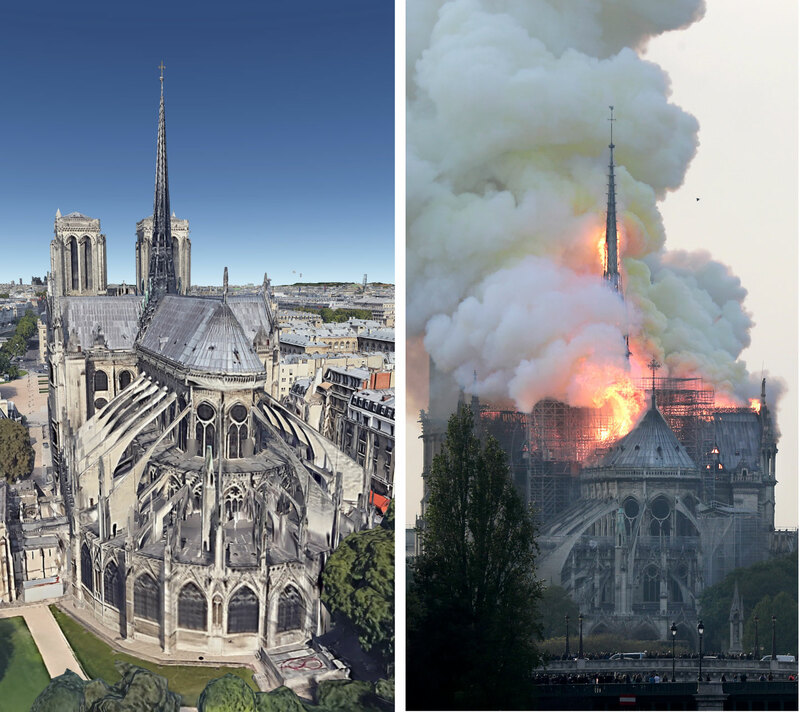 The spire was the first to collapse and that footage was truly horrifying - but thankfully the fires haven't done too much damage to the two iconic belltowers - they are saved! Several important relics and treasures have been saved and the statues of the apostles were only just this taken out for repairs. Many others will be lost; I wouldn't like to be the one drawing up that inventory... But as I was following the live news reports I remembered my visits to the Notre Dame and suddenly it hit me: That wonderful, almost magical light through the windows! The stained-glass windows, my god... they must have all shattered within the first two hours. I heard from a friend that people were flocking together all around the Île de la Cité, staring in utter disbelief, some praying and groups were even singing hymns. Also that the archbishop of Paris asked all parishes to sound their bells. It could be heard all over Paris. He described it very poetically: As if all the Parisian churches cried out to their mother in her darkest hour. Already people are donating for the rebuilding of the Notre Dame, i just read the owner of fashionlabels Gucci and Yves Saint-Laurent has donated 100 million euro - and the owner of Louis Vuitton added 200. it is likely the operation will not be able to start soon, and it will take years and years. Here's to Jean de Chelles, the master mason responsible for Notre Dame's north transept terminal, pierced by 18 lancets surmounted by a rose window, completed c. 1250. Most of the original, thirteenth-century glasswork is still intact, and survived the fire. No matter whether it's craftsmanship or divine intervention, that is a blessing if anything.